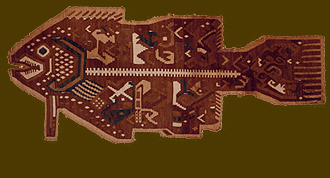 When George Hewitt Myers (1875-1957) first purchased a few rugs in the 1890s – a group of late 19th-century Turkish and Caucasian village rugs – he did not anticipate buying several thousand textiles. As the years passed and his finances allowed, however, his interests grew to include other types of non-Western textiles along with examples from earlier periods. He began collecting classical silk textiles and carpets from the court workshops of Safavid Iran, Ottoman Turkey and Mughal India; early Islamic textiles, including inscribed textiles called tiraz from western Asia, Egypt and Yemen; late antique textiles from Egypt; Indian resist-dyed cotton fabrics found in Fustat, Egypt; and archaeological textiles from Peru; as well as colonial and later pieces from South and Central America. In the early 1920s, Myers’ focus shifted to the meaning of these objects, and he set out to widen the scope of knowledge about textiles. He established The Textile Museum in 1925, and by the late 1930s, the breadth and depth of Myers’ textile collection rendered it internationally significant. When Myers died in 1957, The Textile Museum’s collections included 3,100 textiles from Asia and Africa and 1,500 textiles from the Americas. Today the Museum’s collections include more than 18,000 textiles from around the world.